"I love these new choppers more than the old ones." -J.M. 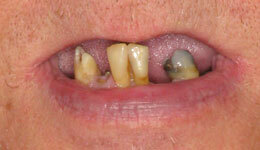 Throw your dentures away!This patient had been wearing a full upper and lower denture for many years. 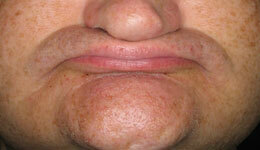 His profile shows a lack in fullness of the lip, over closure and creasing at the sides of the lips. This is due to the wearing down of the dentures. The goal of this treatment was to reestablish a more esthetic and proper vertical dimension and lip support, and provide the patient with a more stable and long-lasting solution than his dentures. Four implants were placed in the lower jaw, which allowed for a non-removable prosthesis to be placed on the patient - in the same visit. 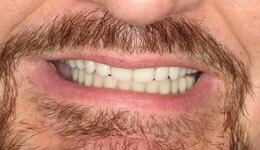 The patient's facial structure was restored, and he was able to leave the office - the same day - with a smile.